Garbage disposals can clog simply with food remains, Particularly if not enough water is used to clear the drain. You can take out small clogs yourself; however, it is a perfect idea to learn more about your garbage disposal before you do. Read more to find out how to unclog a garbage disposal. * If the garbage disposal gets clogged, keep running cold water and turn the disposal off and then back on to see if it will push the clog through. This works for small clogs. 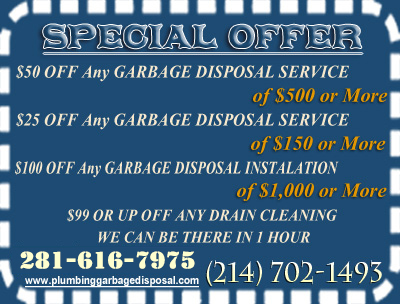 * A plunger has a critical effect for unclogging the garbage disposal. Plug the other side of the sink (if you have a double-basin sink), and the use the plunger on the disposal side. This has keep your sink basin clean from different hard clogs. If plunging on the clogged side isn't effective, then you can test filling the other side of the basin with water and the plunging it during to help loosen things.